It was in the 20s somewhere in the south, when Meade "Lux" Lewis - inspired by the rhythmic-powerful steam hiss – invented the boogie-woogie during the train ride to work. Almost 100 years later you can feel a flashback of the roots of boogie-woogie with this special steam train – and all this on a route which is absolutely unique (see picture above). With 3 special trains, each with two wagons, we are steaming and shaking up to the heavenly heights of 1.780m - and in each wagon a piano! Up there you can enjoy a hearty brunch and you will experiences the "Lakeshakers" on stage with the most extraordinary scenery that you can imagine. As a foretaste, have a look to the pictures of last year or the 360°-view from the top of Schafberg...! Please be in time for departure at the valley Schafbergbahn! 10:30 a.m. - Departure Honky Tonk Steam Train – a piano in each wagon! 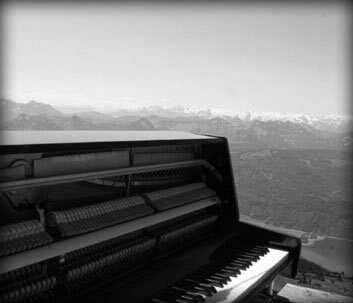 Ca 11:30 a.m. - Hearty Boogie Brunch at the mountain restaurant, 2 pianos on stage! 3:10 p.m. - Descent of the Honky Tonk Steam Train, arriving back down in the valley around 4 p.m. ...Certainly not! In the afternoon, you will sail home inspired like on a cloud! IMPORTANT: CONCERT DEPENDING ON WEATHER CONDITIONS! Honky Tonk Steamtrain & boogie-brunch in the mountaintop restaurant only in fair weather conditions! In case of bad weather, the boogie brunch takes place lakeside in the valley without the train ride!